A white index card containing the name, rank and military history of a soldier of Waterloo County. Card also includes a photograph and two red slashes. Enlisted December 6, 1915 with A. Company 4th Canadian R.C. Transferred to Heavy Artillery. Born at Bridgeport, and educated there. 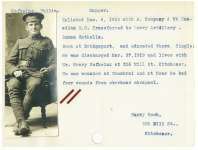 He was discharged March 27, 1919 and lives with Mr. Henry Hofheinz at 235 Mill Street Kitchener. He was wounded at Chambrai and at Mons he had four wounds from overhead shrapnel. Harry Hoch, 235 Mill Street, Kitchener.